Cold-pressed. Raw smoothies. We never add sugar. 103 kcal per bottle. Never pasteurised. 1 of your 5 a day. Award winning taste. Vegan friendly. 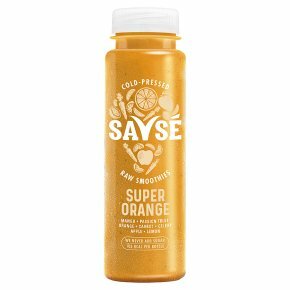 Mango, Passion Fruit, Orange, Carrot, Celery, Apple and Lemon We never pasteurise our fruit & veg (unlike most smoothie & juice brands). Pasteurisation heats up the fruit & veg, destroying the natural vitamins, nutrients and the vibrant flavours. Instead, we use a special, small batch, high pressure process to preserve our drinks. This maintains all the natural goodness of the fruit & veg to create drinks bursting with flavour which taste as good as homemade.